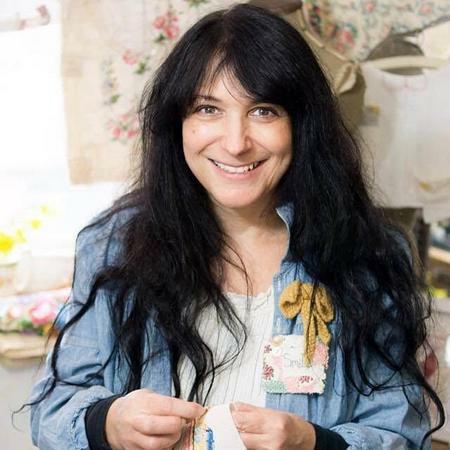 I am a hand weaver and textile designer living in North Cornwall. It is here in this rugged and often windswept landscape that I create colourful, hand woven cloth which is transformed into scarves and cushions. My studio overlooks the cliffs and sea and this is a constant reminder of the inspiration that surrounds me. I find the process from choosing the colours, working out the measurements, warping, dressing the loom, weaving and finishing very therapeutic. I like to work organically adding random bursts of shocking pink next to a burnt orange to create interest or a natural oatmeal with a mustard yellow to soften the colours. Because of this my pieces are unique. My creative path began in the Seventies when at the age of 8 I joined a local Saturday art class run by a bohemian artist and sculptor. It was at these classes I developed skills by working with a variety of materials. An exhibition at the end of each term was the icing on the cake. I yearned to go to art college but my parents had other ideas, much to my dismay. So I enrolled on a Home Management and Childcare course where I trained as a nanny. Working in London during the Eighties provided me with endless opportunities to visit exhibitions and absorb a range of inspiration. Any spare time I had I would sit, draw and dream of being an artist. But finding a way to reach my goal was proving difficult. By the late 1980’s I owned a flat, was married and by the early 90’s I had a new baby to care for, so these things brought new, financial responsibilities which meant my art college dreams were put on the back burner. After moving to Cornwall 21 years ago to live in my Grandparent’s house, I had two more children and life became busier pushing my art college dream further back. But I still had to fuel my creative streak and make money while the children were young. I developed a range of hand painted greeting cards which I sold at local craft fairs and countrywide. I gradually built a successful cottage industry from my kitchen table. It worked well and I loved the buzz of being an artist working from home surrounded by my family and living by the sea. My enthusiasm for art college never waned but I still couldn’t find a way to get there. I have always had a love of vintage and found pieces from bygone days and after visiting Tavistock Vintage fair, I started to develop a body of work to sell at this event. Hand embroidered cards and pictures were made, the stall booked and my textiles journey began. I started collecting old fragments of material and ephemera which I collaged together with naïve hand stitches. My work proved popular and I started to gain a following on social media. But I needed to gain more knowledge so I enrolled on the textiles A’level course at at Truro College. This allowed me to build a portfolio of work which would lead me to a Foundation Art Diploma and Art degree. I became completely immersed in the world of textiles and over time showed an affinity to this fascinating subject. I concentrated mainly on finding ways to combine old materials together with intricate hand stitches. I learnt about various techniques such as printing, image transfer and sketchbook work. I spent two years on my Foundation Art Diploma which enabled me to experiment in various mediums such as printing, intaglio, photography and textural surfaces through workshops and exploratory projects, which has allowed me to widen my view of the art world. 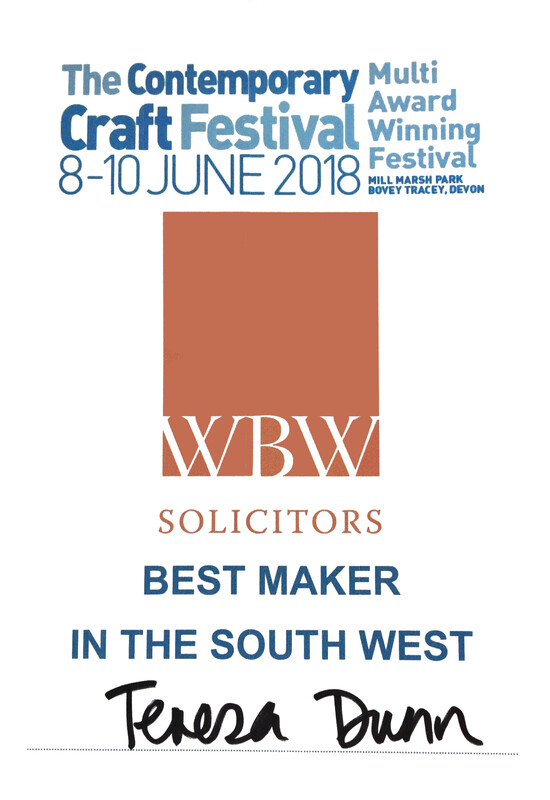 My professional work continued to flourish and evolve allowing me to exhibit at shows such as The Contemporary Craft Festival at Bovey Tracey, Cornwall Design Fair and Selvedge. My dream came true when I was accepted onto the BA (Hons) Textile Practices at Plymouth College of Art. During my First Year I learnt so much. I threw myself into this amazing creative world where I explored textile techniques such as tufting, machine knitting, printing, dyeing, fabric manipulation. Exploration and experimentation was key. It was here I became fascinated with wool, especially the manufacturing process which became apparent after a visit from John Arbonne in Devon who processes the raw materials to create hand knitted socks. Also having Becky Dodman, a knitwear designer as my lecturer was obviously a huge inspiration. Her enthusiasm is amazing! After completing my First Year I wanted to learn a new skill during the summer break. I knew I wanted to specialise in knitwear in the second year so I started doing my research. It was during this time that I came across a weaving series with textile designer Margo Selby on Youtube. I became quite obsessed with the whole process and so my weaving journey had begun! I purchased a preloved four shaft floor loom, collected together wool, tools, books and watched many tutorials online. Gradually I gained confidence on the loom. It was so wonderful to create a piece of hand woven cloth from raw materials. And it was even more encouraging after I launched my scarves at Cowslip Summer Fair and sold four! This was definitely the way forward. I continued weaving lambswool scarves until I went back to art college. After five weeks of working with mixed media I knew my heart was now somewhere else. I applied to Falmouth University to specialise in weave. I got in and will be starting there in September 2018. So in the meantime I weave every day! I have built up quite a following in Australia on Instagram. I now supply ‘The Happen Store’ in Sydney where they fly out of the door as soon as they arrive! I would say to anyone who is unsure whether to embark on their creative journey…..just ‘Go for it!’. It will prove to be exciting and very rewarding.